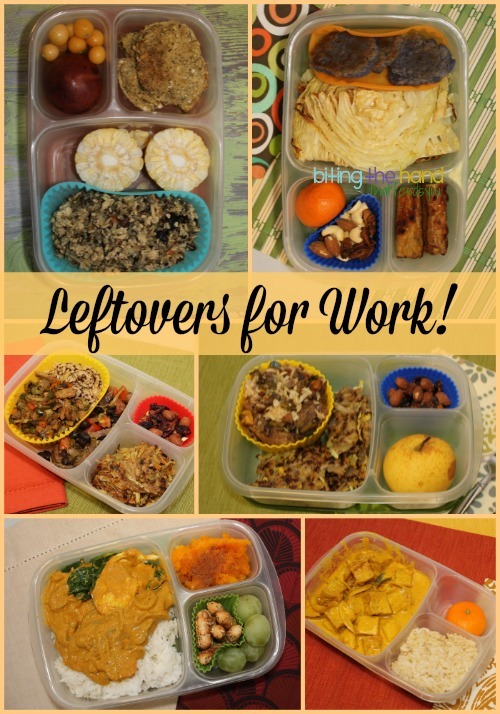 Biting The Hand That Feeds You: Leftovers for Work Lunches! Daddas have to eat lunch too! I haven't packed for Hubby in quite a while... 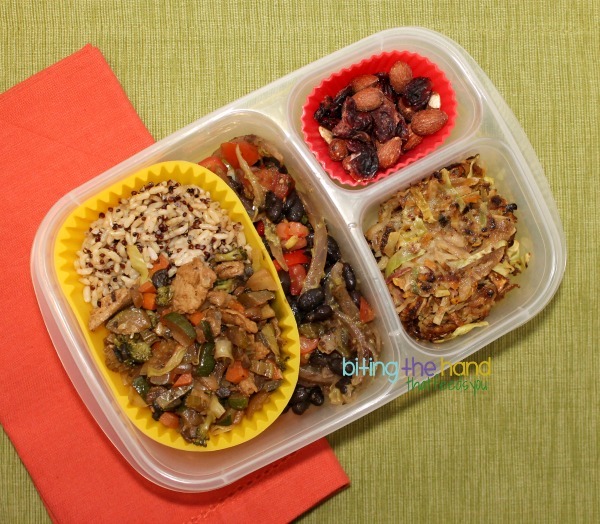 So here are some lunches from a while ago. He's my number one leftovers-eater! For dessert, an organic pluot and some organic ground cherries. He wasn't a fan of those. 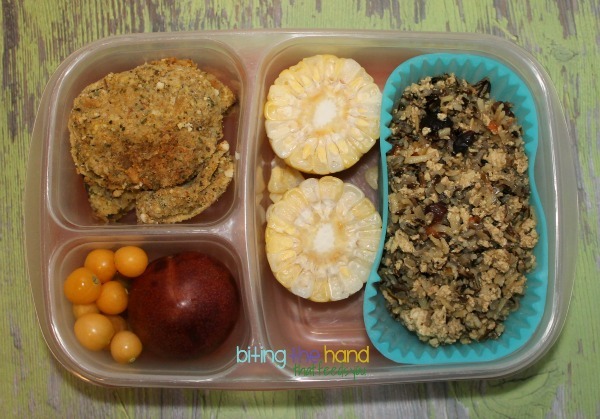 Ground cherries have kind of an unusual flavor and texture. Like sweet miniature tomatillos. 10/9/13 - The jumbo muffin cup has some leftover "kitchen sink" veggie and rice dish with Soy Curls (Organic brown rice, carrots, broccoli, onion, green beans, random veggies needing to get used up...) The rest of that compartment is filled with some leftovers from a Veggie Birds Nest variant recipe (potato-zucchini-carrot-leek.) Hubby loooooooves my Veggie Birds Nests! Some yummy Naturebox Cinnamon Spice Almonds with dried cranberries, and an organic Shinko Pear for dessert. 10/13/13 - More "Kitchen Sink Mix" leftovers with organic brown rice and quinoa, plus some other leftovers mixture with black beans, Looks like tomatoes, onions, and beans. The last of the Veggie Birds Nests, which was pretty much just a pile of hash (yummy yummy hash!) 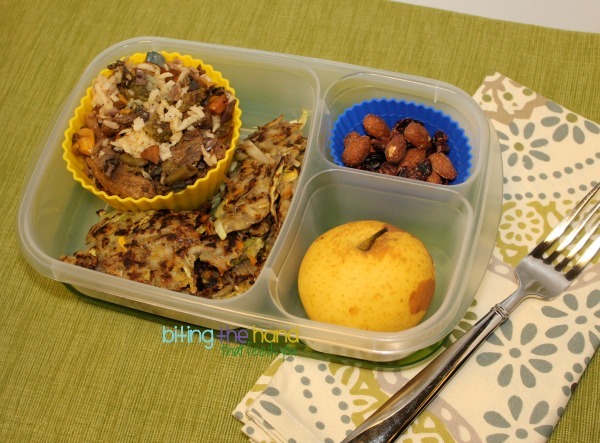 with Naturebox Cinnamon Spice Almonds and dried cranberries again for dessert. 10/24/13 - Thai restaurant leftovers this time! Leftover Swimming Rama with jasmine rice from the restaurant, plus some roasted squash salvaged from the squash carcass the night before. With brown sugar and salt on top! Nom! I had gotten some "everything" breadstick bites from one of the foodie boxes I'd tried, so Hubby got those too, since they had gluten in them. With some jumbo organic grapes for dessert. 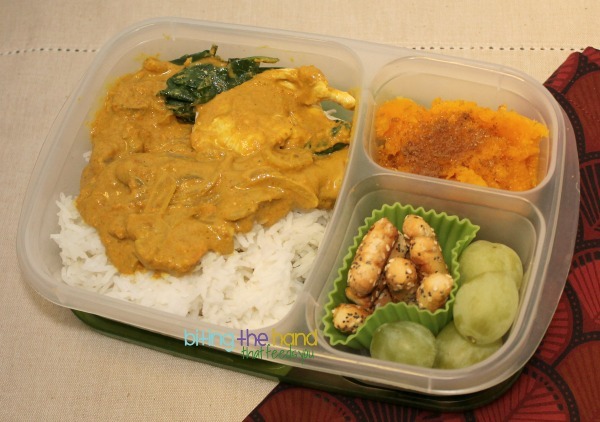 10/27/13 - More Thai leftovers? 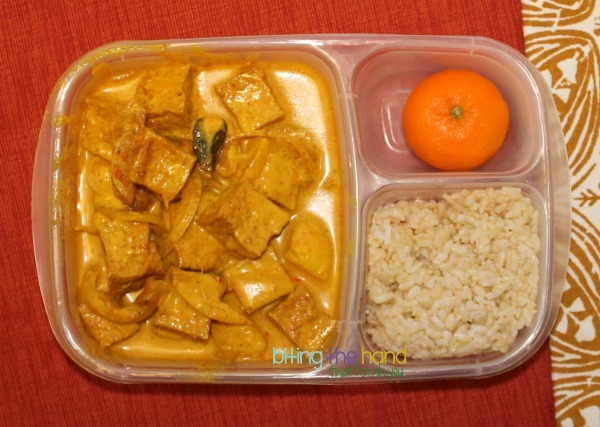 Mussaman curry with tofu with brown rice on the side. And an organic clementine. I had to put some plastic wrap over the large compartment for this one, so Hubby could carry the box sideways in his messenger bag on the bus to work. Worked like a charm! 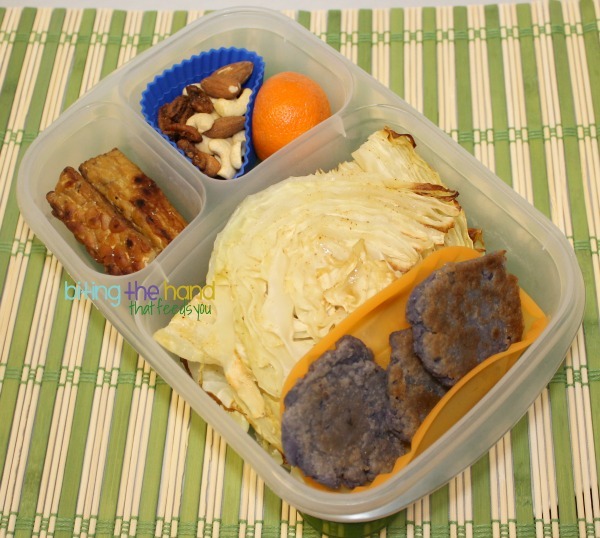 10/29/13 - Leftover roasted cabbage (mine just had salt) and some purple mashed potato patties (from when I got tired of making Smileys!) and leftover fried tempeh. An organic clementine plus some salted cashews, almonds, and pecans for dessert.